KATHMANDU, Feb 20: Chief Minister of Province 4, Prithvi Subba Gurung is having tough time giving full shape to his cabinet as there are multiple aspirants for the remaining three ministerial posts. Three days ago, the chief minister had expanded his cabinet by appointing four ministers -- internal affairs and law, tourism, forest and environment, and land management and agriculture. However, the chief minister is in a fix over appointing ministers for the remaining three ministries after many leaders from the CPN-UML eying the posts. "The provincial government will call a cabinet meeting for Wednesday. But it is still not clear if the next meeting will appoint the remaining ministers. 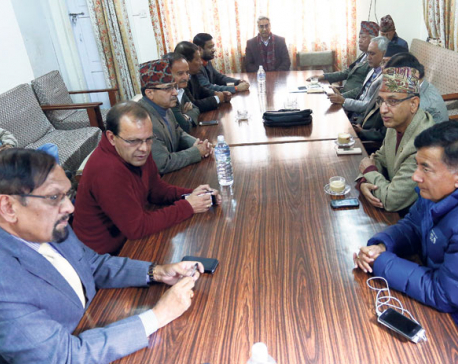 With over two dozen leaders staking claims to the ministerial posts, it has been difficult to decide about ministers," said spokesperson of the government, Ram Sharan Basnet. In the province, as many as 27 elected provincial assembly members are from the CPN-UML and most of them are eying the remaining ministerial posts. He said that the provincial government will appoint ministers considering the candidates' skills, political contributions and seniority. Coordinator of CPN-UML committee in the province, Kiran Gurung said that the chief minister will give full shape to the cabinet by accommodating all the sides.